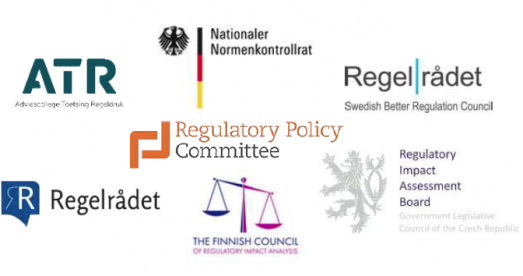 RegWatchEurope consists of seven national advisory boards on reducing regulatory burdens, namely the ‘Advisory Board on Regulatory Burden’ (ATR – The Netherlands), the ‘Nationaler Normenkontrollrat’ (NKR – Germany), the ‘Swedish Better Regulation Council’ (Regelrådet – Sweden), the Czech ‘Regulatory Impact Assessment Board’ (Komise RIA/ RIAB – The Czech Republic), ‘Regulatory Policy Committee’ (RPC – UK), Norwegian Better Regulation Council (NBRC) and the Finish Council of Regulatory Impact Analysis (FCRIA). The seven boards are independent bodies that advise their respective governments on smart regulation in general and on the overall regulatory burden of legislation. We play an important role in challenging, monitoring and advising our governments within our respective mandates. We have joined forces to address Better Regulation issues on EU level. We believe that the EU should continue to reinforce its programmes on smart regulation, developing an ever increasing ambitious framework for ensuring that unnecessary regulatory burdens are avoided, or eliminated from the EU legislative cycle.